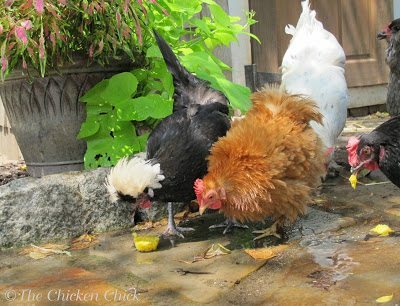 This recipe to help chickens beat the heat will earn you credit toward your master’s degree from Crazy Chicken Lady University. 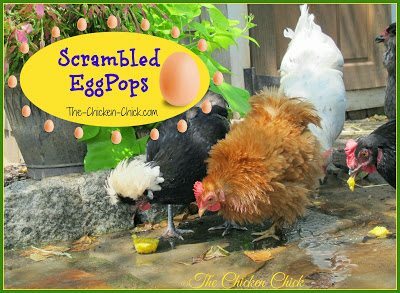 If your friends and family are not yet convinced that you have lost your chicken-lovin’ mind, making Scrambled EggPops will do the trick! 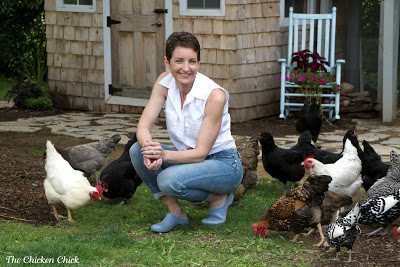 In all seriousness, we have had excessive heat warnings in effect most of the week with a heat index approaching 110°F here in New England today and I have been pulling out all the stops to keep my flock safe and alive, knowing that at temperatures above 104°F, chickens can no longer regulate their own body temperatures and can die. I have been using my mister to bring down the air temperature in their shaded run, offering them watermelon, frozen fruit in ice water and keeping a bucket of cool water nearby in case of emergency, all things I discuss in my article, Beat the Heat, Helping Chickens Survive High Temps.The orange bucket in this photo is kept 3/4 full of cool water in a central location. 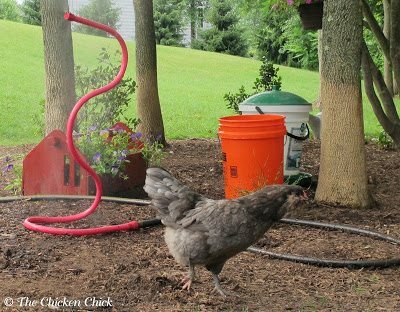 When I come upon a chicken that looks sleepy, listless or is panting excessively, they benefit from a refreshing dip in the emergency bucket. This cools their body temperature down quickly and can save their lives. 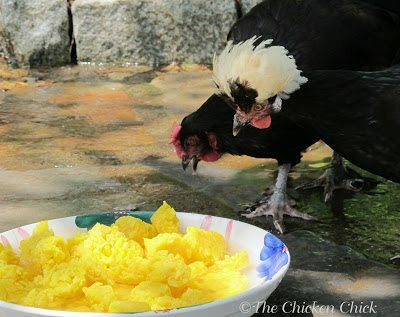 Remember, chickens’ feathers are coated with oils from their uropygial gland, so their feathers will dry up quickly and they may enjoy another dip in the orange pool later in the day. Frozen strawberries, mint leaves, lemon balm and ice cubes make a refreshing hot weather treat. Placing treats in shady areas encourages them to stay in the shade, but not all treats are created equal. In the heat I try to offer options that contain a high water content, a high protein content or both. Today’s treat offered them both. 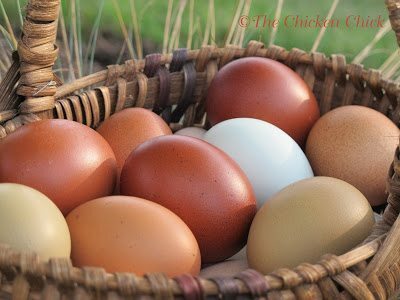 Since chickens will eat less feed in the heat, providing them with a high protein treat in addition to a higher protein ration in their feeders allows them to eat less overall volume while continuing to meet their daily nutritional needs and what better source of protein than eggs? 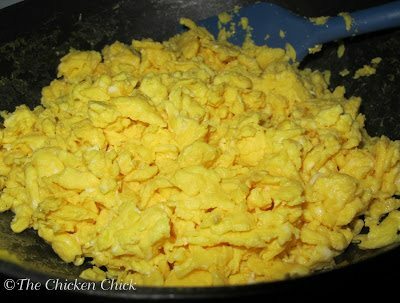 Add cooled scrambled eggs to a cupcake tin with a little water to each compartment and freeze until hardened. Run the bottom of the pan under warm water & the eggs pop right out and are ready to serve to your peeps! Do not be the least bit concerned that this snack is going to cause your chickens to begin the ugly habit of eating eggs from your nest boxes, it will not. I can always count on Doc Brown (White Crested Black Polish hen, shown above) to step up to the plate and test things out first. To say that my chickens were a little leery of this new treat would be an understatement, but that’s par for the course with chickens- they just need a little time to become comfortable with any new situation. 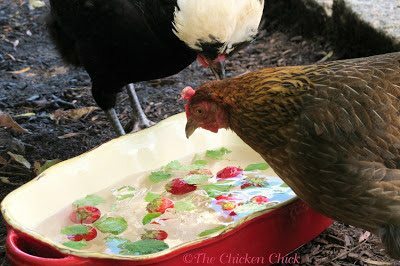 I placed the serving bowl in the stream of cold, running water from the garden hose in order to cool their feet as they enjoyed their snack. The serving bowl acted more like take-out window, however, as they promptly removed the EggPops, dropping them on the ground. 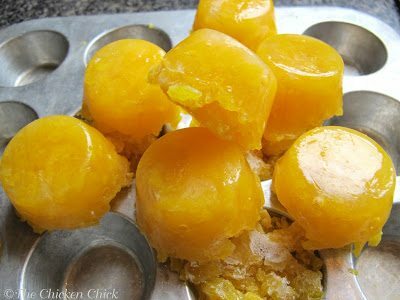 When the rest of the flock got the ALL CLEAR from Doc Brown, they made quick work of their frozen treats. Are your peeps partial to fruit? 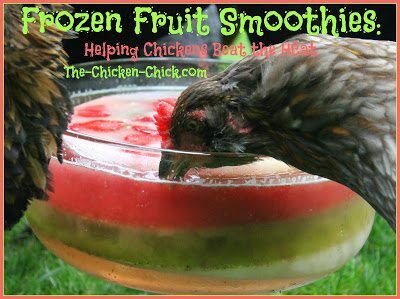 Consider making them some Frozen Fruit Smoothies! Recipe here! My husband scared one of my Polish Hens with the weed wacker. She flew into our pool and to his amazement, swam (?!) over to the ladder and hopped out! So, yes, chix do swim. I think that's a great idea. Looking forward to trying.